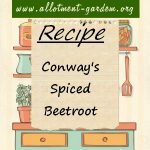 Recipe of Conway’s Spiced Beetroot. An easy and tasty recipe, ideal for with salads and cheese. 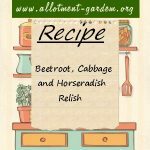 Also a delicious accompaniment to roasts or barbecues. Recipe for Beetroot Gratin. Freezes beautifully and is a great side dish to simple grilled or roast meat as it is quite rich. 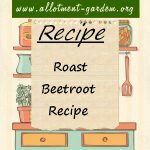 Recipe for Roast Beetroot. Combine in a salad bowl with a french dressing, mint, feta cheese and avocado for a delicious lunch served with bread.. Recipe for Jellied Beetroot. This recipe appeared in the SWRI (Scottish Women's Rural Institute) cookbook about 30 years ago. 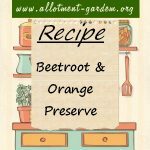 Recipe for Beetroot Cake. A lovely recipe. If not serving straight away, cover with clingfilm and chill and remove from fridge about 30 mins before eating. This is an easy and popular recipe for Beetroot Chutney. Makes about 5 lbs (2.3 kg) of Beetroot Chutney. One of our favourites and that of our friends. Recipe for Sweet and Sour Beetroot. Serves 4 to 6. Especially nice with chicken and rabbit, this side dish is easy to prepare and won't disappoint. Recipe for Beetroot Chutney. 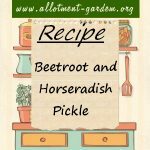 Tasty on meat sandwiches or added to salads. Spice it up a bit by adding a couple of habanero chillies when cooking! Recipe for Bortsch (Beetroot Soup). A tasty, tart soup. Makes approximately 6 servings. Recipe for Hot Spicy Beetroot. 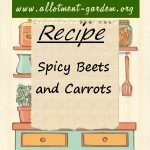 A spicy beetroot recipe, ideal for serving with boiled meats. Recipe for Chocolate and Beetroot Cake. 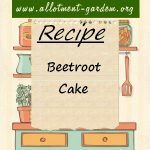 A simple Beetroot and Chocolate cake recipe. This is a lovely moist cake and it doesn't taste of beets (promise).